All cases shown above were calculated with an insulation layer of 10 cm underneath the floor slab. However, industrial buildings are often constructed without an insulation layer underneath the floor. The concrete floor is put directly on some kind of gravel to prevent the concrete from frost damage. Table 2. Comparison of parameters of heavy and wet soil and light and dry soil. How much energy is lost through the floor slab of such a building depends on the physical parameters of the soil underneath. To illustrate the influence of an insulation layer underneath the floor slab and to show the influence of the soil characteristics, simulations were carried out with two extreme sets of soil parameters: very light and dry soil such as sand that doesn’t conduct the heat well and heavy wet soil such as clay that is much more dense and conducts heat well (see Table 2). As expected, the influence of the soil parameters on the heat demand of the building is much larger if there is no insulation layer underneath the building. However, the most important result is that the space heating demand is roughly doubled without an insulation layer underneath the building. number of rows, but it would add an overproduction of thermal energy in summer that can not be used by the power block. This wasted thermal energy is known as dumping of energy. With the methodology proposed in this paper, the optimum size of the solar field is the one that produces the highest electrical power generation with the lowest dumping of energy (below 3%, ). To determine this optimum, simulations with several sizes of the solar field are run along a real year (i. e., introducing ambient temperature and solar irradiation data from a typical meteorological year). The sizes are around the already calculated number of rows, M, in the pre­design. A model of the solar thermal power plant is, therefore, necessary. The model of the solar thermal power plant has two independent components: the solar field model and the power block model (Fig.1). For the solar field model the simulation program TRSNYS (TRansient SYstem Simulations), , has been used. This program has a modular structure, which allows of programming in blocks. The different blocks considered for the solar field models are (Figure 1): a thermal and hydraulic model of a parabolic trough collector, a thermal and hydraulic model of a pipeline connection between two collectors in a row, a solar incidence angle calculator and a block reporting the general arrange of the solar field (number of collectors per row and number of rows in the solar field). It is advisable that the direct normal irradiance and ambient temperature data are mean values in 10 or 15-minute time periods, in order to account transient clouds. The maximum time step to record these meteorological data being considered useful enough is 1 hour. The hydraulic and thermal models of the parabolic trough collectors and their interconnecting pipelines are stationary models. The thermal model uses the corresponding heat balance, while the hydraulic model calculates the pressure drop using the Bernoulli equation. The mass flow of the heat transfer fluid in the solar field is the one which assures at every moment (i. e., under typical beam irradiance and ambient temperature) a fixed solar field outlet temperature. This temperature is always below the maximum bulk temperature of the thermal oil used as working fluid in the solar field and is previously defined for the solar field pre-design, taking into consideration the efficiency of the oil to water heat exchanger and the steam temperature needed at the inlet of the turbine. At the inlet of the turbine, the temperature — and pressure — is considered to be constant, unlike the steam mass flow, which varies depending on the oil mass flow in the solar field. The power block model considers the influence of steam mass flow variations at the inlet of the turbo-generator on its electric output. This influence is handled by a fitting curve obtained from the data given by the turbine manufacturer. A conventional fossil fuel boiler may be introduced if hybridization is considered. The main results of the plant simulation are the incident solar energy onto the solar field, the useful thermal energy produced in the solar field and in the conventional boiler — if any-, the electrical energy generated in the turbine and the dumping of energy, all these results integrated along one year. As an example, let’s consider a parabolic trough solar power plant of 50 MWe somewhere in the South of Spain without storage. It is assumed that there are no restrictions or limitations in the size and orientation of the plot for the solar plant. The heat transfer fluid considered in this example is Therminol VP1 and the parabolic trough collector model is the ET-II (5.76m aperture width, 142.8m useful length). The orientation of the collectors is North-South. The Rankine cycle is assumed to have 38% gross efficiency (thus 131.6 MWth have to be supplied by the solar field at nominal conditions). The power block specifications determine that the temperature of the oil at the inlet and outlet of the solar field are 296°C and 393°C, respectively. 12% conventional fossil fuel energy supply is allowed in a yearly basis. In the pre-design it is assumed a Direct Normal Irradiance of 850W/m2 and an ambient temperature of 25°C. The temperature difference at the outlet and inlet of the solar field and the used collector features determines that every row needs to have 4 collectors. The required thermal power defines that 74 rows are necessary if the calculation procedure explained in section 2 is applied. In the optimization of the solar field, the meteorological data available are given in 1-hour time steps. An interpolation procedure has been followed to obtain 5-minute data sets. 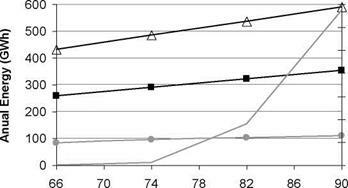 The accumulated annual direct normal irradiation is 2286 kWh/m2. Simulations are run for ±10% of number of rows to have a dumping of energy lower than 3%. Having in mind a central feed configuration of the solar field piping, an even number of rows are necessary, so the annual performances of the plant with 66, 74 and 82 rows are carried out. The annual solar energy onto the collector field (insolation), the thermal energy it produces, the electricity output of the power plant and the percentage of wasted energy is shown in Fig. 2 for different sizes of the solar field. As with 82 rows the dumping of energy was lower than 1%, the corresponding results for a plant with 90 rows are also obtained and shown. Running the plant simulation model with typical meteorological data for 74 rows a small dumping of energy is observed, becoming zero with 66 rows. Increasing the solar field size from 74 rows to 82 rows (10.8 %) the electric energy production increases 10%: from 94GWh to 103GWh. When the performance with 74 rows is compared with the one of 90 rows (21.65% of increase in size), the increase of the annual electric production is 17.2 % (from 94GWh to 110GWh), but with 3.37 % of dumping of energy. Thus the electricity production does not increase/diminish in the same percentage as the increase/reduction of the solar field size. Fig 2. Incident, thermal, electrical and wasted energy as function of solar field size. Keeping the criterion of being below 3 % dumping of energy, the optimized size of the solar field will be between 66 and 88 rows. The next step must be the economical evaluation of these few options. In order to better design a parabolic trough power plant, simulation tools for finding out the optimal solar field size are necessary. Up to now, these simulation tools have an economical criterion as the only figure of merit, requiring a new optimization process every time there was any variation in the economical situation to apply. A way to reduce the number of cases to consider is by including another energetic criterion. This paper presents a methodology to optimize parabolic solar fields where an energetic criterion is applied prior the economical one. A first estimation of the solar field is obtained with a simple calculation, assuming representative meteorological conditions (pre-design). Taking this pre-designed solar field size as reference, annual evaluations of the performance of the plant with different sizes are analyzed. The limits where this size range stays are determined keeping the wasted energy (dumping), due to the oversizing of the solar field in summer, below 3%. presented here, the economical optimization that would follow is reduced to just a few cases. J. I. Ajona, “Electricity Generation with Distributed Collector Systems”. Course: “Solar Thermal Electricity Generation”. Plataforma Solar de Almeria (13th-17th July, 1988). The results of the potential studies for different European countries are reported in the figure and the table below. The potential solar process heat estimated in the PROMISE study for Austria  reaches 5.4 PJ/year, while the Iberian Peninsula (Spain and Portugal, ) and the Italian studies  show a potential of 21 PJ/year and 32 PJ/year respectively. Figure 4. 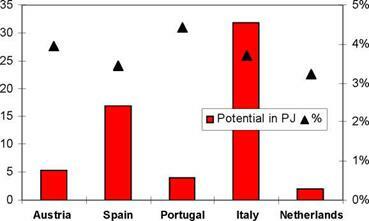 Solar process heat potential in selected European countries (PJ/year). The study carried out for the Netherlands shows a quite lower potential (<2 PJ/year). The reason for this is because the hot water production up to only 60 °C was assessed in twelve industry branches, thereby limiting the scope of the analysis. In Table 1, the potential for the use of solar thermal in the industrial sector in different countries is reported in terms of delivered energy (PJ/year), capacity (GWth) and collector area (Mio m2). These potential figures are also compared to the corresponding industrial heat demand, in order to obtain the share of heat demand that could be covered by using solar thermal. The results reported show that solar thermal systems could provide the industrial sector with 3^4% of its heat demand in Austria, Italy, Portugal, Netherlands and Spain. Extrapolating this result to the European Union (EU 25), considering an average share of 3.8%, the potential for solar thermal applications in industry reaches a value for heat production of 258 PJ/year. The corresponding potential figures in terms of capacity and area have been calculated taking into account two possible yield values for the solar plants: 400 kWh/m2 year and 500 kWh/m2 year. Table 1. Industrial heat demand and solar process heat potential for selected countries and for EU25. Even though solar thermal is used today mainly for providing hot water to households and pools, the conducted survey clearly highlights that, given its relevance in total final energy consumption, the industrial sector cannot be ignored. Moreover, a remarkable share of its heat demand is needed in the low and medium temperature range, and this is true particularly for certain industrial sectors (food — including wine and beverage, textile, transport equipment, metal and plastic treatment, chemical) and for several processes (cleaning, drying, evaporation and distillation, blanching, pasteurisation, sterilisation, cooking, painting, surface treatment). Studies based on both industry statistics and on case studies performed for assessing the solar thermal potential in industrial applications came to consistent outcomes regarding the share of low and medium temperature heat required by the industrial branches noted above. The analysis of the surveyed country potential studies also shows that, even though using quite different methodologies, the obtained figures are quite similar and that solar thermal could provide the industrial sector with 3^4% of its heat demand. This result allows the extrapolation of the national figures to the European level: solar thermal could provide 258 PJ/year of thermal energy to the EU25 industrial sector, which means an installed capacity of 100-125 GWth (143^180 Mio m2). The most ambitious target for solar thermal, developed by ESTIF (European Solar Thermal Industry Federation), is to reach a level of 320 GWth installed in 2020, meaning about 1 m2 per capita and 19.7 Mtoe/year of energy delivered . According to the European Solar Thermal Technology Platform (ESTTP), the goal for 2030 is to have installed a total capacity of 960 GWth by 2030. Assuming that 10% of the calculated potential for solar heat in industrial applications were to be actually implemented within 2020, a total capacity between 10 and 12 GWth in industrial applications would give a contribution of 3^4% to the overall target of 320 GWth. Following these assumptions, the industrial use of solar thermal energy could assure a market volume of 1,000 MWth/year, which would mean a 50% growth with respect to the current European annual solar market volume, that equalled 2,100 MWth (almost 3,000,000 m2) installed in 2006. By exploiting this potential, 10,000-15,000 new jobs could be created by 2020. This figure represents a relevant share of the occupational target for the overall solar thermal sector, which according to the European Solar Thermal Technology Platform will be able to offer 224,000 full time jobs by 2020. Even assuming a quite conservative scenario for the penetration of solar thermal use in the industrial sector, its contribution for reaching the EU set targets for 2020 is significant. Finally, regarding future improvements of this analysis, new and more complete studies are needed within the EU framework to assess the detailed potential at national and EU levels in the different industrial sector and expand the current data available to solar thermal companies and policy makers. W. Weiss, I. Bergmann, G. Faninger, Solar Heat Worldwide — Markets and contribution to the energy supply 2005, International Energy Agency 2007. Data for 2004, based on EUROSTAT statistics. ECOHEATCOOL (IEE ALTENER Project), The European Heat Market, WP 1, Final report, Published by Euroheat & Power. www. ecoheatcool. org. Muller, T. et al., PROMISE — Produzieren mit Sonnenenergie, Potenzialstudie zur thermischen Solarenergienutzung in osterreichischen Gewerbe — und Industriebetrieben within the Fabrik der Zukunft (BMVIT) Subprogram, Final report 2004. H. Schweiger et al., POSHIP (Project No. NNE5-1999-0308), The Potential of Solar Heat for Industrial Processes, Final Report. Solar thermal potential study for process heat in Italy, IEA Task 33/IV. European Solar Thermal Industry Federation, “Solar Thermal Action Plan for Europe”, www. estif. org. The system employed a small capacity fan, 12 DC 5We PAPST that required an external energy supply. The power needed was supplied by a small PV-panel unit of 10 We. Thus the performance of the fan was not continuous and therefore the flow rate was mainly depended on the irradiance levels. Thus for the highest irradiance level, the collector delivered the maximum flow rate and for lower irradiance levels, there was a limit where the fan did not operate. The study of the solar collector performance requires the analysis of the flow rate dependence with the irradiance but also the pneumatic system characteristics. The fan was powered by the PV-panel that pumped the flow through the system to cross the woodchip. In order to find the relationship between flow rate and irradiance, it was necessary to study the pneumatic characteristics of both fan and system, and also the electrical connection between fan and PV-panel separately. of the woodchip layer was 3cm that corresponds to the 3kg of product employed before in the drying tests. Figure 7 shows the collector outlet and collector temperature rise against the irradiance for the same day as previous. Considering that air flow rate increases with irradiance, the graph shows the tendency of temperatures to increase with irradiance as well. For low irradiances the average temperature rise was 10°C and for high irradiance levels it was 20°C. 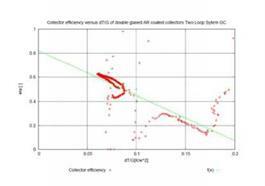 The degree of scatter in the temperature rise is mainly attributed to variances in the ambient temperature and fluctuations in the collector flow. Also the transitory time to the steady state and wind effect may affect in the collector air and absorber plate temperatures . Several MD-modules are operated in parallel. A controller is used for charge and discharge of the heat storage and controlling a set point temperature for the evaporator inlet ^The operation conditions can be optimized regarding performance conditions of the MD process. Simulation computations were carried out for the system design and the development of an adapted control strategy for two different pilot plants. The design capacity for the Aqaba system was 700 — 900 l/day and for the Gran Canaria system 1000 — 1600 l/day. Table 1 provides the key data for both systems. Figure 6 shows a picture of the collector field (left hand side) and the heat storage, hydraulic board and the desalination unit (right hand side) of the Aqaba system installed in December 2005. The two loop system in Gran Canaria was installed in March 2006. The graphs in figure 7 (left side) represent one day of operation of the Compact System in Freiburg on 16th July 2006. The solar irradiation (Irrad) in the collector plain increases up to 1000 W/m2 at noon. The feed pump switches on when a set point temperature of 55°C at the collector outlet is reached. The feed mass flow is in the beginning about 300 l/h and increase with rising solar irradiation to a maximum of 500kg/h at noon. The distillate production starts immediately after the system start up and increases continuously with the rising evaporator inlet temperature and feed volume flow. The maximum distillate mass flow during noon is about 25 l/h. The maximum evaporator inlet temperature is almost 90°C. The temperature at the condenser inlet (Tcond_in) increases during the day, due to the brine recirculation to the feed tank. At 12:00PM the refilling of the feed storage starts initialized by reaching the critical feed temperature of 50°C at the condenser inlet. As can be seen the temperatures (Tcond_in) decrease immediately by 10 K. The total daily distillate production at the 16th July 2006 was about 140 liter. The first Compact System was installed in Gran Canaria in December 2004 and is still in daily operation with the first MD-module. Figure 6 (right hand side) presents a part of these long term measurements in Gran Canaria. The daily distillate gain is plotted versus the cumulated daily gain of solar energy. The considered period starts in the middle of June 2005 and ended in the middle of June 2006. As can be seen from the one year measurements there is no decrease of specific energy demand during the observed period. For example a daily solar gain of 7kWh/m2 enables an average distillate production of 60 l/day in June 05 as well as in June 06. Differences, in both directions, occur due to specific weather conditions an operation conditions. A plot the operation performance of the two loop system in Gran Canaria is presented in figure 8 for a fine day in March. The “Irrad” graph represents the global radiation on the tilted collector surface. The “TCol_out” graph is the collector outlet temperature and the “T_evap_in” line represents the evaporator inlet temperature as adapted by the control unit. As can be seen the collector outlet temperature and the evaporator inlet are rising comparably until 11:00 AM (IG=500W/m2) when the set value at the evaporator inlet is reached. Then the collector outlet temperature continues rising while the evaporator inlet is set to 80°C. Fig. 8: 24 hour measurement and collector field efficiency of the two loop system in Gran Canaria in March 2006. From 6:30 PM to 7:30PM the controller switches to storage discharge. As can be seen the temperatures are fluctuating and can not be controlled to the set value. The reason can be found in the slow reaction time of the control unit respectively the slow movement of the Valve. From 7:30PM to 22:30AM the temperature control operates successfully again and the evaporator inlet temperature is set again to 80°C until the storage top temperature decreases below that value. The system is operated with a decreasing evaporator inlet temperature and decreasing distillate flow until 4:15AM, March 24. Then the switch of temperature of 58°C at the evaporator inlet is reached. The distillate volume flow during operation on the set point temperature is about 75 and 80 kg/h. The cumulated distillate gain from the operation period between 10:00 AM March 23 and 6:15 AM March 24 is 1240kg. The specific energy consumption of the MD unit is in the range of 260 kWh/m3 distillate for low evaporator inlet temperatures of 55°C and decreases down to 180kWh/m3 distillate at a set point operation temperature of 80°C. The specific energy supplied by the collector — respectively the storage loop is 14% to 23 % higher than consumed by the MD unit. That difference can be considered as system losses. Canaria two-loop system. It was calculated from the temperature difference between collector field in — and outlet, the collector loop mass flow rate, the specific heat capacity of water (Cp) and the measured global radiation in the collector plain. It can be seen from the graph that in the range of standard operation between 0.06<(dT/G)<0.08 (for G =1000W/m2 and Tamb=20°C this is equal to an average collector temperature range of 80 — 100°C) the collector field efficiency is between 0.61 and 0.5. 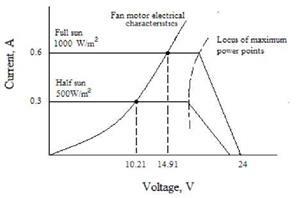 The stagnation temperature for G=1000W/m2 and Tamb=20°C can be calculated from the efficiency curve with 200°C. In many cases it is not only more economic but also more efficient to stop the solar system under high irradiance than to store every single Joule which is not used soon and would get lost in the tank later. Therefore our principal concept is to avoid large storage tanks. This is even more the case where high temperatures are required that are accompanied by higher heat losses of the tank. On the other hand systems with small or without tanks can deliver solar heat much faster under bad irradiation conditions if the heat capacity of a storage tank is not a barrier. The thermal standstill is a normal thing for water systems. In future the restarting of water systems from the thermal standstill will also be a matter-of-course as soon as heat is needed again. A storage capacity of 0.5 kWh per m2 collector area is transferred on the roof and can be saved with the storage tank. This is about 1/100 of the annual energy harvest or even more. A solar collector system that can be restarted from standstill at any time promises a much higher annual energy harvest than installations which can only leave stagnation by cooling down through natural heat losses. With these positions Paradigma differs essentially from the official recommendations which are based on the traditional flat plate collector technology. All over Europe, the process heat demand in this temperature range is estimated to about 400 TWh per year. The potential for solar process heat is estimated in  to be 90-112 GWth for the EU25 countries. The development of this market potential will open new growth segments for the European solar thermal industry. Moreover, very promising possibilities for the export of new solar thermal technology exist world-wide, especially to countries and regions with high solar irradiation. Therefore it is necessary to develop new appropriate collectors, system components, storage tanks and complete solar process heat systems in the next years. The aim should be to achieve a number of ‘good practice examples’ within the next years, so that in the future an increasing part of the process heat demand can be covered by solar thermal technology. All results presented in this paper were simulated using solar thermal collectors integrated into the south facade (collector tilt angle = 90°). Heat losses from the building can be reduced because the effective u-value of the wall with integrated collector is reduced even when solar radiation is low. In addition, overheating of the collectors during times of stagnation in summer can be avoided. Project POWERSOL  aims at the “development of an environmentally friendly improved- cost shaft power generation technology, based on solar thermal energy, optimized for supplying basic need to rural communities”, bringing solar thermal mechanical power/electricity generation to a smaller scale (power outputs up to 500 kW) and allowing the use of cheaper and simpler optical systems, suitable for applications with lower requirements of maintenance and operation expertise, as those found in industry, desalination or small communities. In the present article, a performance analysis of such a power system is presented, allowing a preliminary assessment of its design. The paper addresses the use of different solar collector technologies in the production of heat, in a range of top cycle temperatures between 150°C and 250°C, suitable for both stationary and single-axis tracking solar collectors. The use of heat storage and backup systems, allowing extended cycle operation, is also assessed. System performance is evaluated after yearly operation simulation for different locations, enabling an evaluation of the most suitable design for different locations and operation conditions. The production of electricity or mechanical energy by means of solar energy conversion, has gathered, in the most recent years, a research effort proportional to the increasing interest of such technologies, as a solution covering the needs of either small and isolated communities or large scale power plants. Whereas the photovoltaic conversion of solar radiation is a well established technology for electricity production, the technologies based in the thermal conversion present a growing number of applications, especially large scale plants based in different types of high concentration systems. such cases, the Organic Rankine Cycle (ORC) can be an alternative, given its relative high thermal efficiency and the use of dry fluids, impeding vapour condensation at turbine outlet [1-6]. Within the framework of the EU funded project POWERSOL [1,6], a solar thermal driven ORC is being considered, aiming the development of a small scale mechanical power generation technology. The mechanical energy produced could be converted into electricity and/or be used in desalination, water pumping or cooling. The heat rejected in the cycle could also be used — improving the exergy efficiency of the whole system — for water and space heating or cooling. The core of the power system is an Organic Rankine Cycle (ORC), whose application in power generation at low temperature is well known, with a number of waste heat, geothermal and biomass based examples. In relation to solar thermal — driven ORC’s, there is a lower number of experiences, being the most representatives the Coolidge Solar Irrigation project  and the Small Communities Project  both developed at the beginning of the 80’s and the recently 1-MW solar thermal power plant operated by the Arizona Public Service in Saguaro (E. E.U. U.) . Angelino et al. also give a number of low power output solar heated ORC systems. Three different top temperature levels are considered in the POWERSOL project, corresponding to different solar thermal collector technologies: cycle 1 — 80°C (flat plate collectors, FPC); cycle 2 — 150°C (compound parabolic collectors, CPC); and cycle 3 -200°C-250°C (parabolic trough collector and linear Fresnel concentrators). Solar collector prototypes are being developed specifically for each temperature level and a small ORC pilot plant will be erected in the PSA . Considering a preliminary dimensioning of the overall system components (solar field, heat storage, ORC), results for yearly performance of both cycles 2 and 3 are presented in this paper, for three different locations: Almeria (Spain), Cairo (Egypt), Moura (Portugal), considering a system of 100 kW gross power output with different heat storage capacities, operating with or without a conventional energy backup. Nanostructured semi-conductor materials based on titanium dioxide, with effective photo-catalytic properties under UV illumination, were synthesized and characterized with the objective of studying the photo-catalytic hydrogen production from water. The need to decrease the electron — hole recombination rate was accounted for by metal doping. Ethanol was used as a hole trap. Aqueous suspensions of the semiconductor powders, with noble metal loadings (Pt) were used for a selected catalyst concentration. Hydrogen production was found to be linear with UV irradiation time at near room temperature. pH variations during hydrogen production were followed and associated to the formation of acetic acid during the reaction. Keywords: hydrogen production, doped-titanium dioxide, ethanol, photo-catalytic materials. The generation of hydrogen from water splitting using photo-catalytic surfaces of oxide materials has been recognized since the early seventies . In the last decades interest in semiconductor photocatalysis has grown significantly, with works mostly referring to uses in water/air purification. The photo-catalytic production of hydrogen by means of irradiation of a suspension of semiconductor oxides, presents attractive features over other methods with higher cost such as water electrolysis. Some of the materials properties and requirements for solar hydrogen production include tailored electronic structure: band gap — essential for absorption of solar energy; and flat band potential — must be higher than the redox potential of the couple H+/ H2. Furthermore, efficient charge transport is necessary since low electrical resistance is required as well as effective charge separation and prevention of electron-hole pair recombination. Titania is the base catalyst material of choice, notwithstanding the stability and non-corrosive properties, and the environment friendliness and low cost, the actual efficiency in the production of solar hydrogen is still very low, due to electron-hole pair recombination [2-6] and also due to TiO2 band gap (~3.2 eV) which only allows utilization of UV light. durability. In order to increase efficiency in the use of semiconductor electrodes in electrochemical photolysis, integrated systems including semi-conductor / redox couples interfaces, deposition of metallic co-catalyst, sensitizers, etc. have been studied [2,3]. The modification of TiO2 properties may contribute for a more efficient hydrogen production that may take advantage of visible light utilization [4,7,8,9]. Effective charge transfer from water molecules and the TiO2 lattice requires the presence of surface active sites, associated to point defects, that can form activated complexes with water molecules. In this work, a nanostructured semi-conductor material based on titanium dioxide, with effective photo-catalytic properties under UV illumination, was used for hydrogen production using ethanol as a sacrificial agent, with excellent results. A photochemical reactor with a total volume of 4.40 litters distributed between an internal (irradiated) reactor and an external reactor (fluid reservoir) was used according to need; a sensing pH electrode was allowed for as well as facilities for titration of H+, in order to adjust pH, when required. The internal reactor was contained in a black box and used a 450 W Hg immersion lamp (A. C.E. Glass Incorporated, NJ), as a radiation source. The emission spectrum of the lamp indicated that the UV radiation is mainly situated between 313 and 366 nm. Circulation between reactors, when required, was ensured by a peristaltic pump, according to the required recirculation rate. Agitation by magnetic stirrers in both reactors was also used. In this paper, titanium dioxide Degussa P-25 was modified by photochemical deposition of Pt. Platinised TiO2 catalyst (at 1.5 wt.% Pt) was prepared using hexachloroplatinic acid (Riedel-de Haen) as the precursor. A pre-determined amount of TiO2 was first suspended in hot water and the hexachloroplatinic acid previously dissolved in an aliquot of fresh distilled water was added, with continuous nitrogen purging (15 min.) inside the described photo-reactor. The mixture was irradiated for 60 min, at constant temperature (30-40°C), to ensure that all the platinum in the suspension was reduced and deposited onto the surface of TiO2. The TiO2 / Pt catalyst was subsequently recovered by filtration and washed repeatedly with water. Finally, the powder was dried at 70°C and stored under vacuum in a desiccator. Catalyst were heat treated at 440 °C during one hour. After some preliminary studies a concentration of TiO2 of 0.5 gL-1 was selected as well as a concentration of ethanol of 5 M and an initial pH of 11. Characterisation of the powders was done by X-Ray diffraction using a Rigaku, model D-Max IIIC and by scanning electron microscopy (SEM) using a Phillips model XL 30 FEG microscope coupled to EDS. In this work, a nanostructured semi-conductor material with effective photo-catalytic properties under UV illumination was synthesized using a photochemical method, taking as a base Degussa P-25 powder and platinum salts. X-Ray diffraction data of the synthesized powder indicated the presence of anatase and rutile, see figure 2a). Anatase content was estimated to be ~ 89.21% and the crystallite size 21 nm. Typical morphology of the powder is shown in figure 2b), exhibiting particle size at a nanoscale. Aqueous suspensions of the semiconductor powders, with noble metal loadings (Pt) of 1.5 wt% were used and the hydrogen production studied, for a fixed amount of the catalyst of 0.5 g/L. A 5M concentration of ethanol was used. 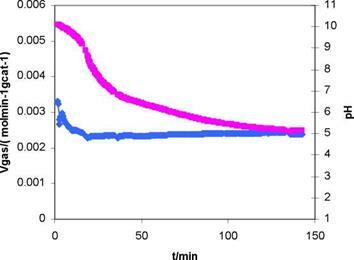 Typical results obtained during the photocatalytic production of hydrogen by UV illumination of the suspension of TiO2-Pt are shown in figure 3. The rate is presented in terms of the number of mol per unit time of produced gases by gram of catalyst. A titration confirmed the presence of large amounts of acetic acid, indicating that pH variations during the reaction must be significant. Typical pH variations with irradiation time were measured starting from the initial pH value of 11 falling to 5.1, see figure 3.
synthesized Pt-TiO2 . The pH solution variation is also shown. Another possible reaction pathway is the involvement of adsorbed surface hydroxyls on TiO2 in the trapping of holes. The interaction of surface hydroxyl groups with holes will result in the formation of hydroxyl radicals which, in turn, will interact with C2H5OH or its intermediates adsorbed on the metal — TiO2 surface or present in the vicinity to produce CO2 and other side products. Work proceeds with analysis of the gas mixtures by gas chromatography. Work in progress includes comparison with own synthesized sol-gel titanium dioxide modified with Pt in the similar experimental conditions. Modification of the titanium dioxide band gap is also in progress, in order to account for the advantageous use of visible light . Titania was used as the base catalyst material of choice for solar hydrogen production, due to its stability and non-corrosive properties, as well as environmentally friendliness and low cost. The need to decrease the electron-hole recombination rate was accounted for by platinum deposition and the addition of ethanol as a hole trap. o Gas production rates were found to be linear with time at near room temperature. o pH variations during hydrogen production were striking changing from 11 to values as low as 5.6, this is thought to be due to the formation of acetic acid during the reaction, accounting for the lower concentration of CO2 and CH4 found by gas chromatography Keeping the pH in the alkaline range ensured a constant rate of gas production for extended periods of time. Further work is needed to identify low cost metal loading materials with acceptable enhancement for hydrogen production, as well as modified catalysts that allow effective utilization of visible light. Acknowlegments are due to B. Charasse, J. Chesnau and M. Pinho for assistance in some of the experiments. A. Fujishima, A Honda, Nature, 238 (1972), 37-38. — Y. Z. Yang, C. H. Chang, H. Idriss, Appl. Catal. B, 67 (2006) 217-222. — G. R. Bamwenda, S. Tsubota, T. Nakamura, M. Haruta, J. Photochem. Photobiol. A, 89 (1995) 177-189. — A. R. Gandhe, J. B. Fernandes, Bull. Catalysis Society of India, 4 (2005) 131-134. — S. Pilkenton, Son-Jong Hwang, D. Raftery, J. Phys. Chem. B, 103 (1999) 11152-11160. — Z. Zaina, L. K. Hui, M. Z. Hussein, Y. H. Taufiq-Yap, A. H. Abdullah, I. Ramli, J. Hazardous Materials, B125 (2005) 113-120. — J. C. Kennedy III, A. K. Daty, J. Catalysis, 179 (1998) 357-389. — G. Marci, V. Augugliaro, A. B. Prevot, C. Baiocchi, E. Garcia-Lopez, V. Loddo, L. Palmisano, E. Paramauro, M. Schiavello, Societa Chimica Italiana, Annalli di Chimica, 93 (2003) 693-644. — C. G. Silva, W. Wang, J. L. Faria, J. Photochem. Photobiol. A, 181 (2006) 314-324. — R. Gouveia, R. A. Silva, C M. Rangel, Mat. Sci. Forum, 514-516 (2006) 1385-1390. — Y Li, C. Xie, D. Peng, G. Lu, S. Li, J. Mol. Catal. : A Chem., 282 (2008)117-123.